Animated movies are so cute. Cloudy with a Chance of Meatballs (2009) is no exception. Judging by the title, this is bucketloads of fun...and it is. Flint Lockwood (voiced by Bill Hader) is a young man who likes to invent stuff. He comes up with a genius idea to turn water into food. One day, he thinks his invention goes extremely wrong, but then all of a sudden...it starts raining hamburgers. Flint realizes that he can control what comes down from the sky...ice cream, meetballs, hot dogs, whatever everyone wants. But the portions of food are getting bigger, and causing some problems. 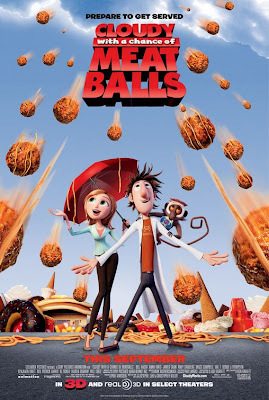 Cloudy with a Chance of Meatballs has so much originality, and I am surprised it wasn't nominated in the Best Animated Feature category at the Oscars. While watching, I couldn't help but think this was a combination of Charlie and the Chocolate Factory and 2012. The latter because it has a theme of 'the end of the world', so I like to think of this as the fun version of 2012. It is just so funny, so scrumptious and so entertaining. This will definitely keep the kids entertained for one and a half hours. This is a movie that has joined the hall of fame of the great animated movies. Almost as good as Up and Wall-E, but has it's own place as one of the coolest films in 2009. One film that will keep you laughing from start to finish...you will love it.